The NLC may use committees to assist in its work and assist neighborhood associations. Each committee shall be approved by the NLC with a charge, which shall be reviewed annually. Committee members may be volunteers or appointed. The rules are as follows. A Committee of the NLC must include at least one NLC representative but may also include non-NLC members. Committees can meet in person or electronically. Committees shall report back to the NLC at least twice a year. Committee cannot commit the NLC to a policy or position without a vote on the matter by the NLC itself. On Tuesday, November 22, 2016, the Neighborhood Leaders Council unanimously approved a resolution to to build a community that is welcoming, inclusive, just and safe for everyone. To help provide direction and resources to the NLC and therefore Neighborhood Associations, with capacity building assistance from HRNI staff. Direction and resources will focus on helping Neighborhood Associations with strategies to reduce barriers to participation and in working towards being more inclusive through increasing awareness around equity issues and participating in neighborhood hate/bias prevention and response. 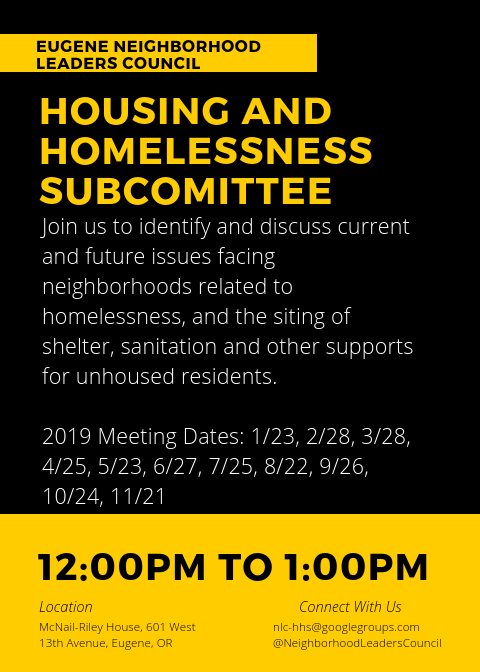 Facilitate monthly meetings to support the acquisition and siting of shelter, sanitation and other supports for their unhoused residents. Review and evaluate issues of concern to neighborhood leaders and provide information and recommendations for advisory motions to the City Council and for actions to protect, repair and enhance neighborhood livability. Provide information to neighbors to help them better understand land use planning and effectively advocate on land use for their neighbors. The subcommittee was approved in Jun 2018. The primary charge is to enable neighbors to effectively participate in the City Council mandated Clear and Objective Housing Approval Criteria Update currently scheduled to have new land use code writing completed by January of 2019 and formal adoption by Council by Summer 2019. The City has determined that recent legislative action requires that there be a clear and objective approval path for the following land use applications: Partitions, Subdivisions, Planned Unit Developments, Conditional Use Permits and Site Reviews. Additionally the Land Use Board of Appeals and Local Hearings Official decisions have made the 19 lot rule and the requirement for Transportation Impact Analyses moot and the code for the Willamette Greenway may soon follow. These have a significant impact on how land use decisions are made. This project has as a specific goal to create a more efficient and effective path for land use applications. It is our task to ensure that any new code also protects neighborhood livability as well. The project anticipates that focus groups will be the primary mechanism for gathering information from the public. It became clear at the first Neighborhood focus group that most if not all of us lack a comprehensive understanding of the affected existing land use processes which hampers our ability to propose and respond to suggested changes in the code. Develop an understanding of current code for the application types proposed for new or revised Clear and Objective standards. Identify the current deficiencies in these application types so we can propose language that ensures that the new/revised code serves the needs of all residents including affected neighbors. Monitor the progress of the project to inform City Council if the timeline is too ambitious and request additional time to develop and approve effective code. Educate the NLC and Neighborhood Associations on the these processes, proposed changes and potential impacts so that they can advocate for improved land use processes. Who should volunteer: Any neighbor with experience in land use processes and those interested in learning more. Ideally to participate until the process is complete (currently set for next summer).